A hybrid is a mixture or composite of two distinct sources. The word can refer to any number of things including animals, plants, language, technology, music, etc. A progeny from any cross involving parents of differing genotypes. A duplex polynucleotide formed by hybridizing two single strands of different origin. However, it most commonly refers to an organism produced by crossbreeding. The hybrid is the progeny that results from mating genetically dissimilar parents or stock. It especially refers to those produced by human breeding of plants or animals of different breeds or species, although wild varieties are recognized. Hybrid plants are created when the pollen from one kind of plant is used to pollinate an entirely different variety, resulting in a new plant. Father false killer whale, mother bottlenose dolphin, and child Wolphin, at the Sealife park in Hawaii. The mule - is a cross between a horse and a donkey. The zorse - is a cross between a horse and a zebra. 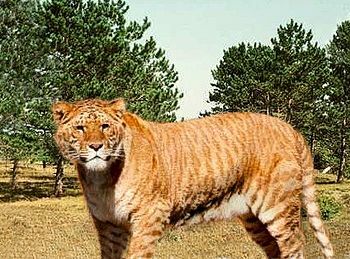 The liger - is a cross between a lion and a tiger. 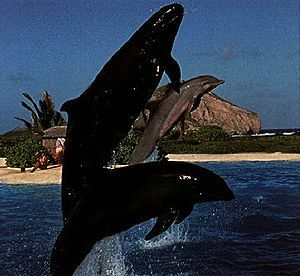 Kekaimalu the wholphin is a fertile hybrid of two different genera, the false killer whale and bottlenose dolphin. Kekaimalu herself gave birth to a calf, showing she was a fertile hybrid. Thus these creatures classified as different genera are really a single polytypic (many-type) species. Bos (true cattle) and Bison (American buffalo) can produce a fertile hybrid called a cattalo. Bos and Bison are thus likewise the same polytypic species although they are classified as different genera. The creationist Don Batten helped create a hybrid of the fruit species lychee (Litchi chinensis) and longan (Dimocarpus longana), again classified as different genera. Creationists believe that the ability for different species to mate indicates that they are of the same baramin (created kind). Identifying the created kinds is critical for understanding the evolutionary history of the world, and hybridization data has become an important tool to meet this need. To aid in the identification of baramin, a database of known cases of interspecies reproduction was developed. Ashley Robinson and Todd Wood started an internet database of published references to such interspecific hybrids. This important creation science research tool is called the HybriDatabase. The database is hosted and maintained by the Center for Origins Research (CORE) at Bryan College. The database currently contains nearly 5000 hybrid records. Hybridization data is also used to argue that the created kind is broader than the species, and often synonymous with the family level of taxonomic classification. This page was last modified on 31 May 2012, at 13:40.